Despite the general conviction that homelessness is a unitary phenomenon, there is ample evidence that persons without permanent living arrangements differ significantly among themselves (Culhane and Metraux, 1999). Recognition of this heterogeneity has led to attempts to classify subgroups of homeless persons (herein referred to as subtypes) according to a variety of characteristics and dimensions, such as (chronicity, substance abuse, psychopathology, and childhood vulnerability factors). An important consideration in the search for subtypes of homeless persons is the specification of essential environmental, situational, and personal characteristics that have a direct role in the development, patterning, and course of homelessness. The goal of this chapter is to review conceptual issues and methodological strategies for developing a typology of homeless families with children. In particular, the chapter examines the feasibility of using a multidimensional conceptual and analytic strategy to determine how best to identify distinct subgroups of families with specific constellations of risk factors and service needs. The ultimate goal of this chapter is to inform both clinical practice and public policy, including the need for effective interventions and prevention programs. Should the typology work within a single domain of variables or should it be multi-dimensional? Should the working material for the typology include individual and group strengths as well as risk factors? Should the working material include cross sectional or longitudinal variables, family variables or individual characteristics? What are the relative merits of disaggregating families from individuals? Is one typology going to be sufficient, or should there be several? Is it better to focus on the causes or the consequences of homelessness? Having described the conceptual issues that justify the development of typological formulations, particularly in relation to homelessness and homeless families, this section considers the benefits and disadvantages of various methodological approaches for typology development, as well as criteria for selecting variables, measurement procedures and statistical methods for the identification of homogeneous subgroups. Among the methodological approaches that have been employed in typological research on psychiatric populations are clinical description, statistical discrimination, and response to treatment. Clinical description is based on observation of clinical cases that come to the attention of service providers. A major limitation of early attempts at clinical description is the failure or inability to use objective measurement techniques to provide a basis for testing assumptions about differences between subtypes. With the advent of structured interview schedules, psychiatric diagnostic criteria, personality inventories, and administrative data bases used to collect descriptive information, quantitative procedures have been used to identify homogeneous groups. For example, subtype discrimination and identification can be brought to a higher level by using statistical clustering techniques that identify homogeneous subgroups based on correlations among individuals sharing similar characteristics. From the experience gained in other areas of clinical research, it is clear that classification theory and clinical practice should both be grounded in objective clinical assessment and sound research methodology. It is, therefore, important to focus on the selection of classification variables and their measurement as the most fruitful empirical approach to the development of a typology. A typology of homeless families should build on the existing knowledge. Most homeless families are experiencing severe poverty and that subsidized housing is enough in the majority of instances to help them gain a stable home. There are smaller groups for whom this does not seem to work, presumably because other environmental, personal, or situational factors. There may be environmental barriers to housing subsidies and other services. Aside from their extreme poverty, homeless families belong to a heterogeneous population. They fall into three groups: newly and recently homeless, recurrently homeless, and chronically homeless. The first group is the largest and the third is much smaller. Personal factors associated with family homelessness are loss of employment, welfare support, spouse or partner; eviction from current living quarters; recent violence; physical or sexual abuse in childhood and/or foster care or lack of stable housing during developmental phases; belonging to African American or Hispanic minorities; pregnancy; hospitalization; and substance abuse, medical problems as well as mental disabilities. At the individual or family level, these findings are consistent with a theory that homelessness is associated with severe poverty, lack of access to housing, and exposure to traumatic events, some of which go back to childhood. At the population level, the theory that homelessness is associated with a gap between the number of low-income families and the availability of low-income housing units (the homelessness equation) is well suited to the facts. There is evidence that, while children can be quite resilient, homelessness provides them with serious hazards shared, at least in part, with children experiencing severe poverty in their home (Buckner, 2005). Such hazards include hunger, poor physical health, poor access to health care, disrupted education, barriers to home work; exposure to bias associated with stigma; insults to self-image and to parental image; exposure to violence, psychological abuse; drug abuse; separation from family members; separation from parents and foster care placement; and lack of a stable, secure home during development. Research on children who are homeless with their families is far less advanced than research on homeless youth. Research on homelessness, in general, and on homeless family typologies in particular, should be guided by the context in which research policies are developed. In the historical context of the 1980s, the problem was focused on single homeless persons and on mental disorder (“the homeless mentally ill”) and abuse of various substances. Thus, at the Federal level, the problem was “owned” by mental health and substance abuse agencies, and those agencies funded the waves of research in the 1980s and 1990s, and the characteristics of homeless persons were targeted. The rapid increase in the number of adults and children that are homeless as a family group led to additional research funded by private foundations and local government, as well as demonstration projects to address such homelessness. The results refocused the problem on housing and, therefore, housing subsidies, and on the developmental damage done by unstable housing situations, poverty, and sexual or physical abuse. The simplistic view that treating mental disorder or substance abuse would solve the homelessness problem is no longer tenable. Rather, the solution has to be systemic, a point that is reflected in the organization of the Federal U.S. Interagency Council on Homelessness. In the Department of Health and Human Services (HHS), the problem now requires planning and evaluation of the role of HHS’s various social and health divisions, as well as a concerted collaborative effort involving the Department of Housing and Urban Development (HUD). In this new context, typologies of homeless families must include exogenous (housing environment, housing and health/human services access), endogenous (characteristics and history of homeless families and their members), and situational (fit between homeless families’ needs and accessible environmental resources) components. A systematic approach to developing a typology should take into account their practical value for: (1) preventing homelessness; (2) securing a home for homeless families; (3) preventing recurrence of homelessness; (4) providing human and health services to meet the needs of homeless families and their members; and (5) offsetting the harmful developmental effects of homelessness on children. The typologies could be used to assign homeless families or children to groups that would be relatively homogeneous with regard to policy development at Federal and local governmental levels, and service provision at the provider level. At the governmental levels, the prevalence estimates and distribution of the population of homeless families among the various groups would guide the development of programs among and between agencies. At the provider level, the classification of the client families among the classification categories would guide various providers in the selection of interventions at various stages in the process of experiencing and responding to homelessness: imminent eviction by landlord or flight from abusive home, presentation to initial service agency, assignment to initial shelter, interaction with welfare, employment and other agencies, provision of needed personal services to adults and children, temporary housing, with or without support, and finally, permanent housing. Differing typologies within this general format might be applied to housing, health and human services, and education of children. Detailed typologies might be developed within each dimension (i.e., service needs based on endogenous variables, environmental context based on exogenous). Ultimately, the interaction between endogenous and exogenous factors needs to be investigated, to the extent that the distribution and prevalence of service need subtypes is likely to vary with the environmental context, with environments having a high density of barriers (e.g., high unemployment, lack of services, poor housing stock) more likely to include families with minor or moderate service needs, whereas facilitating environments (e.g., ample services, low unemployment, adequate low income housing) more likely to include families with major service needs. Homeless individuals or families are often classified as being newly homeless, on the one hand, or recurrently or chronically homeless, on the other hand. Sometimes a third group of recurrent (but not chronic) cases is included. The smaller, chronic group utilizes a disproportionate amount of shelter and other services. It has been proposed (and introduced as policy to end homelessness) that efforts be targeted to this small chronic group. This has been countered by advocates of homeless families who point to the significant needs of the much larger group of new and recurrent homeless families. Here are recommendations for two types of typological research: (1) new data collection efforts targeted at developing and validating one or more typologies; (2) studies using existing data sets. Abi Habib, N., Black, T., Pratt, S., Safir, A., Steinbacyh, R., Triplett, T., Wang, K., the Westat Group, and Wivagg. J. (2005). NSAF Methodology Series: The 2002 Collection of Papers. Washington, DC: The Urban Institute. Babor, T.F. (1996). The classification of alcoholics: Typology theories from the 19th century to the present. Alcohol Health & Research World, 20(1), 6-17. Babor, T.F., and Dolinsky, Z.S. (1988). Alcoholic typologies: Historical evolution and empirical evaluation of some common classification schemes. In R.M. Rose and J. Barrett (Eds. ), Alcoholism: Origins and Outcome (pp. 245-266). New York: Raven Press. Babor, T.F., Hofmann, M., Del Boca, F., Hesselbrock, V., Meyer, R., Dolinsky, Z., and Rounsaville, B. (1992). Types of alcoholics, I: Evidence for an empirically-derived typology based on indicators of vulnerability and severity. Archives of General Psychiatry, 49, 599-608. Bahr, H., and Caplow, T. (1970). Old men drunk and sober. New York: New York University Press. Bassuk, E.L., Buckner, J.C., Perloff, J.N., and Bassuk, S.S. (1998). Prevalence of mental health and substance abuse among homeless and low-income housed mothers. American Journal of Psychiatry, 155, 1561-1564. Bassuk, E., Buckner, J., Weinreb, L., Browne, A., Bassuk, S., Dawson, R., and Perloff, J. (1997). Homelessness in female headed families: childhood and adult risk and protective factors. American Journal of Public Health, 87, 241-248. Bassuk, E.L., Perloff, J.N., and Dawson, R. (2001). Multiply homeless families: The insidious impact of violence. Housing Policy Debate, 12, 299-320. Bassuk, E.L., Weinreb, L.F., Buckner, J.C., Browne, A., Salomon, A., and Bassuk, S.S. (1996). The characteristics and needs of sheltered homeless and low income housed mothers. JAMA, 276, 640-646. Buckner, J.C. (2005). The impact of homelessness on children: An analytical review of the literature. Burt, M., Aron, L.Y., Douglas, T., Valente, J., Lee, E., and Iwen, B. (1999). Homelessness: Programs and the people they serve: Findings of the National Survey of Homeless Assistance Providers and Clients. Prepared for the Interagency Council on the Homeless. Washington, DC: Urban Institute. Calsyn, R., and Roades, L. (1994). Predictors of the past and current homelessness. Journal of Community Psychology, 22, 272-278. Culhane, J.F., Webb, D., Grim, S., Metraux, S., and Culhane, D. (2003). Prevalence of child welfare service involvement among homeless and low income mothers: A five-year birth cohort study. Journal of Sociology and Social Welfare, 30(3). Danseco, E.R., and Holden, E.W. (1998). Are there different types of homeless families? A typology of homeless families based on cluster analysis. Family Relations, 47(2), 159-185. Farrow, J.A., Deisher, M.D., Brown, R., Kulig, J.W., and Kipner, M.D. (1992). Health and health needs of homeless and runaway youth. Journal of Adolescent Health, 13, 717-726. FEANTSA. (The European Federation of National Organizations Working with the Homeless). March 2005. Policy Statement: How to measure homelessness and housing exclusion. Brussels: European Council. Fischer, P.F., and Breakey, W. (1985). Homelessness and mental health: An overview. International Journal of Mental Health, 14, 10-12. Goering, P., Tolomiczenko, G., Sheldon, T., and Wasylenki, D. (2002). Characteristics of persons who are homeless for the first time. Psychiatric Services, 53, 1472-1475. Hutchison, W., and Stretch, J.J. (1992). Social networking with homeless families. In, R.I. Jahiel (Ed. ), Homelessness: A Prevention-oriented Approach (pp. 218-227). Baltimore: The Johns Hopkins University Press. Institute of Medicine. (1988). Homelessness, Health and Human Needs. Washington, DC: The National Academy Press. Jahiel, R.I. (1987). The situation of homelessness. In R.D. Bingham, R.E. Green, S. White (Eds. ), The homeless in contemporary society (pp. 99-118). Newbury Park: Sage Publications. Jahiel, R.I. (1992a). Empirical studies of homeless populations in the 1980s. In R.I. Jahiel (Ed. ), Homelessness. A prevention-oriented approach (pp. 40-56). Baltimore: The Johns Hopkins University Press. Jahiel, R.I. (1992b). Homeless-making processes and the homeless makers. In R.I. Jahiel (Ed. ), Homelessness. A prevention-oriented approach (pp. 269-298). Baltimore: The Johns Hopkins University Press. Jahiel, R.I. (Ed.). (1992c). Homelessness. A prevention-oriented approach. Baltimore: The Johns Hopkins University Press. Kerteszy, S.G., Larson, M.J., Horton, N.J., Winter, M., Saitz, R., and Samet, J. (2005). Homeless chronicity and health-related quality of life. Trajectories among adults with addictions. Medical Care, 43(6), 574-585. Kuhn, R., and Culhane, D.P. (1998). Applying cluster analysis to test a typology of homelessness by pattern of shelter utilization: results from an analysis of administrative data. American Journal of Community Psychology, 26, 207-232. Levinson, B.M. (1963). The homeless man: A psychological enigma. Mental Hygiene, 47, 500-601. Link, B.G., Susser, E., Stueve, A., Phelan, J., Moor, R.E., and Struening, E. (1994) Lifetime and five-year prevalence of homelessness in the United States. American Journal of Public Health, 84, 1907-1912. Mackenzie, D., and Chamberlain, C. (2003). Homeless careers: Pathways in and out of homelessness. Australia: Swinburne and RMIT Universities. ISBN 0-97608 50-0-X. Masten, A.S., Susman, A., Si-Asar, R., Lawrence, C., Miliotisw, D., and Dionne, J.A. (1997). Educational risks for children experiencing homelessness. Journal of School Psychology, 35(1), 27-46. McChesney, K.Y. (1992a). Growth of homelessness: An aggregate rather than an individual problem. In R.I. Jahiel (Ed. ), Homelessness. A prevention-oriented approach (pp. 309-314). Baltimore: The Johns Hopkins University Press. McChesney, K. (1992b). Homeless families. Four patterns of poverty. In M.J. Robertson and M. Greenblatt (Eds. ), Homelessness: A National Perspective. New York: Plenum. McChesney, K. (1995). A review of the empirical literature on contemporary urban homeless families. Social Service Review, 69, 429-460. McLellan, A.T, Kushner, H., Metzger, D., Peters, R., Smith, I., Grissom, G., Pettinati, H., and Argeriou, M. (1992). The fifth edition of the Addiction Severity Index: Historical critique and normative data. Journal of Substance Abuse Treatment, 9, 199-213. Millon, T. (1991). Classification in psychopathology: Rationale, alternatives, and standards. J Abnorm Psychol., Review Aug, 100 (3), 245-61. Rafferty, Y., and Rollins, N. (1989). Learning in Limbo: The educational deprivation of homeless children. New York: Advocates for Children of New York. Rafferty, V., and Shinn, M. (1991). The impact of homelessness on children. American Psychologist, 46, 1170-1179. Rog, D.J., Gilbert-Mongelli, A.M., and Lundy, E. (1998). The final unification program: final evaluation report. Washington, DC: CWCA Press. Rog, D.J., and Gutman, M. (1997). The Homeless Families Program: A summary of key findings. In S.L. Isaacs and J.R. Knickman (Eds. ), To improve health and health care: The Robert Wood Johnson Foundation anthology. San Francisco: Jossey Bass. Rog, D., McCombs-Thornton, K., Gilbert-Mongelli, A., Brito, C., and Holupka, C.S. (1995). Implementation of the Homeless Families Program: Characteristics, strengths and needs of participant families. American Journal of Orthopsychiatry, 65(4), 514-527. Ropers, R.H. (1988). The invisible homeless. A new urban ecology. New York: Human Sciences Press, 178. Roth, D. et al. (1985). Homelessness in Ohio. A study of people in need. Columbus, OH: Department of Mental Health. Schiff, L. (1990). Would they be better off in a home? National Review, 42(4), 33-35. Shepherd, M.D. (2000). An empirical typology of the homeless mentally ill. Abstract @2884. 128th annual meeting of the American Public health Association. Shinn, M., Weitzman, B., Stejanovich, D., Knickman, J., Jiminez, L., Duchon, L., James, S., and Krantz, D.H. (1998). Predictors of homelessness among families in New York City: From shelter request to housing stability. American Journal of Public Health, 88, 1651-1657. Stark, L. (1992). Demographics and stereotypes of homeless people. In Jahiel (Ed. ), Homelessness. A prevention-oriented approach (pp. 27-39). Baltimore: The Johns Hopkins University Press. Stojanovic, D., Weitzman, B.C., Shinn, M., Labay, L., and Williams, N.P. (1999). Tracing the path out of homelessness: The housing patterns of families after exiting shelter. Journal of Community Psychology, 27, 199-208. Stretch, J., and Krueger, L. (1992). Five-year cohort study of homeless families. A joint policy research venture. Journal of Sociology and Social Welfare, 19, 73-88. 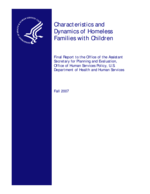 Substance Abuse and Mental Health Services Administration. (2004). Homeless Families Project (HPF) 2004. Washington, DC: Vanderbilt University. U.S. Department of Housing and Urban Development. Notice of funding availability for the Collaborative Initiative to Help End Homelessness. Available at http://www.hud.gov/offices/cpd/homeless1apply32002nofa/index/cfm. U.S. Department of Housing and Urban Development. (2004). Notice of HUD’s Fiscal Year (FY) 2004 funding availability (NOFA). Policy Requirements and General Section to the superNOFA for HUD’s Discretionary Programs. Vol. 69. Washington, DC. Federal Register, 26941-27921. Vostanis, P., and Cumella, S. (Eds.). (1999). Homeless children: problems and needs. London: Jessica Kingsley. Weinreb, L., Goldberg, R., Bassuk, E., and Perloff, F. (1998). Determinants of health and service use patterns in homeless and low-income housed children. Pediatrics, 102, 554-562. Weinreb, L., Wehler, C., Perloff, J., Scott, R., Hosmer, D., Sagor, L., and Gunderson, C. (2002). Hunger: Its impact on children’s health and mental health. Pediatrics, 110(4), e41. Weitzman, B., Knickman, J., and Shinn, M. (1990). Pathways to homelessness among New York City families. Journal of Social Issues, 46(4), 123-140. Weitzman, B., and Berry, C. (1994). Formerly homeless families and the transition to permanent housing: High-risk families and the role of intensive case management services. Final report to the McConnell Clark Foundation. New York: New York University. Whitman, B.Y., Accardo, P., and Sprankel, J.M. 1992. Homeless families and their children: Health, developmental and educational needs. In Jahiel (Ed. ), Homelessness: A Prevention-oriented Approach (pp. 113-126). Baltimore: The Johns Hopkins University Press. Wong, Y.L., Culhane, D., and Kuhn, R. 1997. Predictors of exit and reentry among family shelter users in New York City. Social Service Review, 71, 441-462. Zlotnick, C., Kronstadt, D., and Klee, L. (1998). Foster care children and family homelessness. American Journal of Public Health, 88, 1368-1370.